Toronto, November 17, 2015 – Today, the City of Toronto, together with philanthropists Judy and Wil Matthews and Waterfront Toronto announced a $25 million partnership that will create a new public landscape beneath a section of the Gardiner Expressway. In making the announcement, Judy Matthews was joined by Mayor John Tory, Waterfront Toronto CEO John Campbell, Toronto City Councillors Joe Cressy (Ward 20) and Mike Layton (Ward 19) and Lai-King Hum, President of the CityPlace Residents Association. The Matthews’ generous gift will fund the creation of more than four hectares (10 acres) of new public space and 1.75 kilometres of multi-use trail beneath the elevated expressway from just west of Strachan Avenue to Spadina Avenue. This unprecedented philanthropic partnership represents a new, collaborative model for building high-quality public spaces in Toronto. 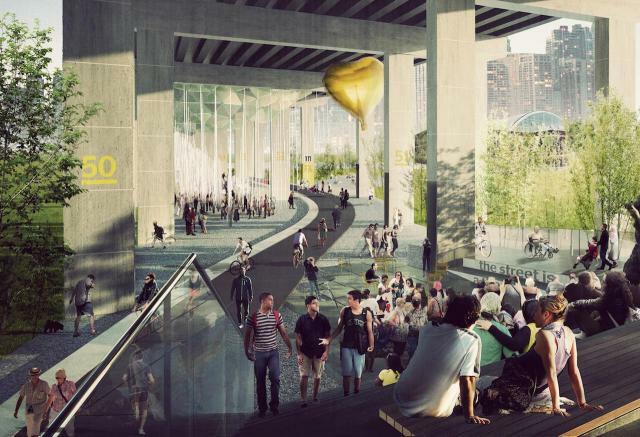 The initiative, temporarily called Project: Under Gardiner, will transform the areas beneath the expressway into vibrant community spaces that will play host to a range of cultural programming – creating a new outdoor living room for the use of the 70,000 residents in nearby neighbourhoods and for visitors who use the many amenities and attractions in the area. Project: Under Gardiner envisions a dynamic new public space that creates connections between some of Toronto's newest and most dense neighbourhoods, including Liberty Village, Niagara, Fort York Neighbourhood, CityPlace, Bathurst Quay and Wellington Place. The project will knit these communities together with innovative programmable spaces that will showcase Toronto's unique cultural and related offerings – music, food, theatre, visual arts, education and civics, dance, sports and recreation. These spaces have been conceived as “rooms” that are defined by the series of concrete post-and-beam structural elements supporting the Gardiner. Up to 55 civic rooms can be fashioned to house a wide variety of year-round programming. The trail will create a new off-street route for walking and cycling that touches some of the City’s densest and most walkable urban neighbourhoods. Project: Under Gardiner will create a new east-west cultural and amenity corridor that helps to connect attractions across the waterfront, including Molson Amphitheatre, BMO Field, Historic Fort York, Toronto Music Garden and the revitalized Queens Quay, Harbourfront Centre, the CN Tower, Rogers Centre, Toronto Railway Museum, Ripley’s Aquarium, the Air Canada Centre and the Toronto Islands via the Jack Layton Ferry Terminal. Renowned city planner and urban designer Ken Greenberg heads the design team, working with Adam Nicklin and Marc Ryan of PUBLIC WORK, a leading urban design and landscape architecture studio. Together, they have established a framework for the project that will use key landmarks as anchors – Historic Fort York and its stunning new Visitor Centre, the new Fort York Library, and nearby green spaces such as June Callwood Park, Coronation Park, Garrison Common and the Toronto Music Garden on Queens Quay. Waterfront Toronto will manage and build the project on behalf of the City, and the Matthews' gift will leverage the City's existing investment in rehabilitating and maintaining the Gardiner Expressway. Waterfront Toronto will also lead public engagement and consultation for Project: Under Gardiner, inviting Toronto residents to participate in the design process and development of the programming vision. Through social media, the project website, a drop-in space and public meetings, Torontonians will be able to provide their feedback, suggestions and ideas. Further details on public consultation and engagement will soon be shared. Public engagement on this project will begin with Reclaim the Name, a campaign that will ask members of the public to help give the space a name that is uniquely Torontonian. The campaign will begin in December. This new collaborative public space requires a new model for ongoing operations and maintenance. The Matthews have asked the City and Waterfront Toronto to develop a self-sufficient funding model that ensures this new space has the enhanced operation and maintenance service levels needed to support vibrant community programming and activities. Construction is set to start in the summer of 2016, with the initial phase of the project aiming for completion in 2017.